As time goes on, I find myself caring less and less about the brand of purse I carry - and more and more about the price of corn and the practicality of something. It seems that most days, my bogs are the footwear of choice as they are both dry and warm - a combination that none of my designer pumps seem to offer. My coveralls, while not highly fashionable and several sizes to big, do a much better job of keeping dirt out and warmth in. I have become familiar with such fashion houses as Carhartt, Dickies, FarmGirl, and Rosies. I am constantly amazed that I manage to "clean up so well" for my off farm day job! So was it little wonder that I would invest in a Fleece Union Suit? I reasoned that they were popular in Vermont, an area known for it's celebrity sightings. So surely it can't be too unfashionable - can it? 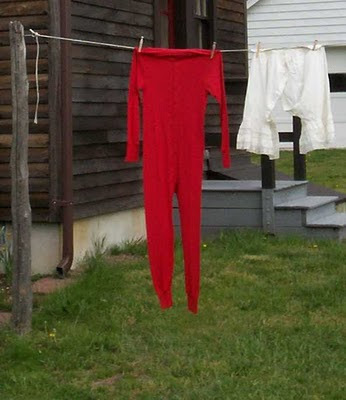 Our drafty old farmhouse is simply not suited for the skimpy choices available today for women's loungewear. Flannel or fleece is more than just a choice, it's a neccessity. I did notice that it is surprisingly similar to some of the baby sleepers I see for small children, but I am trying to ignore that.